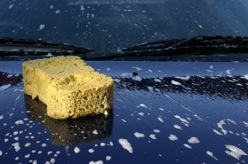 Stumped on what to use for an eco-friendly car wash? Try using a gentle, biodegradable dish soap. When I wash my car this weekend, I’ll probably use warm water and Ecover’s Herbal Dishwashing Liquid. This may seem like a good idea but it’s not. Yes you will water your lawn but even if you use a safe non-toxic car wash liquid the metal from the car is bad for the environment. Cars should be washed at the carwash as they have to clean the water.